Construction began in September 1990 on a 10 million litre per year fuel grade ethanol plant. Operations began in August 1991. Shareholders have the first right to deliver grain based on price and quality being equal. When shareholders are unable to fullfill Pound-Maker’s requirements, non-shareholders and grain companies may deliver. Grain is milled and mixed with water to create a mash. 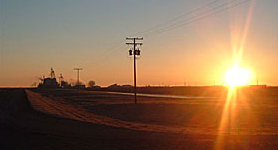 High starch feed wheat is used in ethanol production. The mash is cooked at high temperature to begin the conversion of starch into sugar. The mash is cooled and moves into a fermentor tank. There are 4 fermentor tanks in the plant. It takes 20 hours to fill one tank, meanwhile; the other 3 tanks are at varying stages of fermentation. The fermentation process takes an additional 48 hours to complete. 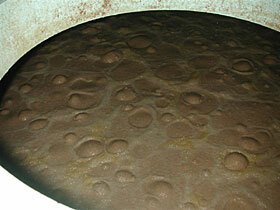 During fermentation, yeast converts the sugar into ethanol and carbon dioxide. The alcohol after fermentation is complete is called beer, 12% ethanol by volume. The beer is transferred to another tank, the beer well, and is pumped to the distillation column. The slide shows the product looking into the top of the fermentor. In the distillation column, the beer is “boiled” allowing the ethanol vapors to move to the top of the column. At this point, the ethanol is 95% alcohol. The unfermented grain and water fall to the bottom of the distillation column. The ethanol is now dehydrated by moving through a bed of beads that captures the water molecules and allows the ethanol molecules to pass through. At this point the ethanol more than 99.4% alcohol. The ethanol is denatured with gasoline before it leaves the ethanol plant. The denatured ethanol is transferred into storage tanks. Tankers pick up the ethanol and take it to blending stations where the ethanol is mixed with gasoline. The grain and liquid from the distillation tower are further separated to produce two co-products – Wet Distilliers Grain and Thin Stillage. As the grain and liquid move through the screw press, the liquid is “squeezed” from the grain co-product. In a kernel of wheat, 2/3 is starch and is used in the production of ethanol. The remaining portion of the kernel is mostly protein, which is wet distillers grain. The wet distillers grain is very moist (75%). 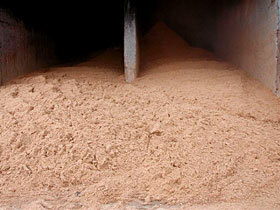 The protein of the wet distillers grain is about 3 times the protein of the grains used in ethanol production. 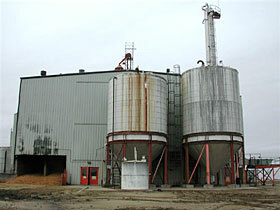 The wet distillers grain is temporarily stored in a bunk at the back of the ethanol plant. The water that has gone through the ethanol process and is separated from the wet distillers grain co-product is called thin stillage. The thin stillage has 9% suspended grain solids as well as other nutrients. The thin stillage is circulated underground to the cattle in the D-E-F-G wings. 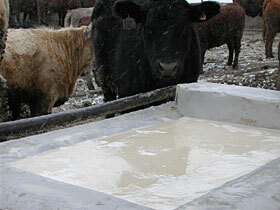 The cattle consume the thin stillage at the water bowls in the pens. The ethanol plant is operated from the control room. The computer system monitors and tracks the production process. The ethanol plant runs 24 hours per day, about 350 days of the year, with the remaining days of the year used for plant maintenance. The ethanol production staff consists of 13 people and includes management, plant maintenance, licensed steam engineers and production staff. The ethanol plant was integrated with the feedlot facility in an effort to consume more locally grown grain and to create employment opportunities. The ethanol plant consumes approximately 110 metric tonnes of grain per day, produces about 40,000 litres of ethanol per day and employs 13 people.